To enable this login method, the line [[Optional settings#Use_one_time_passwords|<code>$use_one_time_passwords = false;</code>]] has to be set 'true' in config.php (it is 'false' by default). * The passed plain text password will be hashed using the sha256 function and will then be compared to the stored hash in column ''one_time_pw'' of table ''users''. Both passwords have to match. 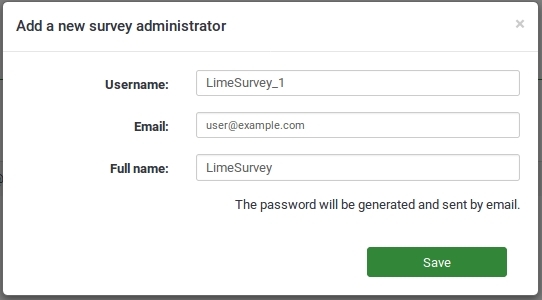 The user management tool allows you to add additional administration users to LimeSurvey. We will call them in this chapter just 'users'. Do not confuse them with survey participants (respondents).